However with this change, the Draenischer Trank der Verjüngung no longer requires alchemy skill to consume as it did prior to the material update. Maybe this is obvious, but if you're trying to maximize your instant mana restore while in combat, Draenischer Trank der Verjüngung (~16k mana restore) is not the best option. Draenischer Manatrank (~32k mana restore) is better as it restores twice the amount of mana. Draenischer Manatrank does not share a cooldown with Heiltonikum and can be used back-to-back while in combat. Draenischer Manatrank shares a cooldown with Draenischer Trank der Verjüngung so they cannot be used while in combat during the same fight. 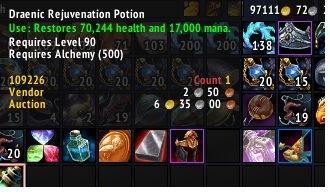 If you want to maximize your instant mana restore while in combat but still want some instant health restore, pop Draenischer Manatrank (~32k mana restore) followed immediately by Heiltonikum (~68k health restore) rather than using a single Draenischer Trank der Verjüngung (~16k mana and ~68k health restore). If you're not concerned with maximizing mana restore and are instead looking to maximize health restore while in combat, pop a Draenischer Trank der Verjüngung followed by a Heiltonikum to restore ~136k health and ~16k mana. Dieser Gegenstand kann geangelt werden in Frostwall (6) und Mondsturz (6).